What do you do with an embarrassment of chillies? Normally, I deep freeze chillies and keep a year’s supply to hand. But when I picked 500g of ‘Piri Piri’ chillies from a single plant, I had to change my plan. ‘Piri Piri’ is a chilli which originated in Portugal and was introduced into South Asia during the colonial period. It’s perfect for making a potent chilli jam. The Scoville Scale was developed to measure the heat of the capsinoids, a group of compounds that give chillies their heat. The scale ranges from zero for a capsicum to 2.2 million for the ‘Carolina Reaper’ chilli. A measurement of one part capsaicin per million corresponds to about 15 Scoville units. Capsicum and chilli are the same species, Capsicum annuum, and they cross-pollinate quite easily. I have three variants (mongrels, really) which originated from a cross between an old plant of the yellow ‘Siam Gold‘ chilli and a red Capsicum ‘California Wonder‘. They illustrate how varied cross-pollinated progeny can be. One turned out to be a small, golden yellow fruited perennial capsicum with a little heat, another is currently 4m high (!) 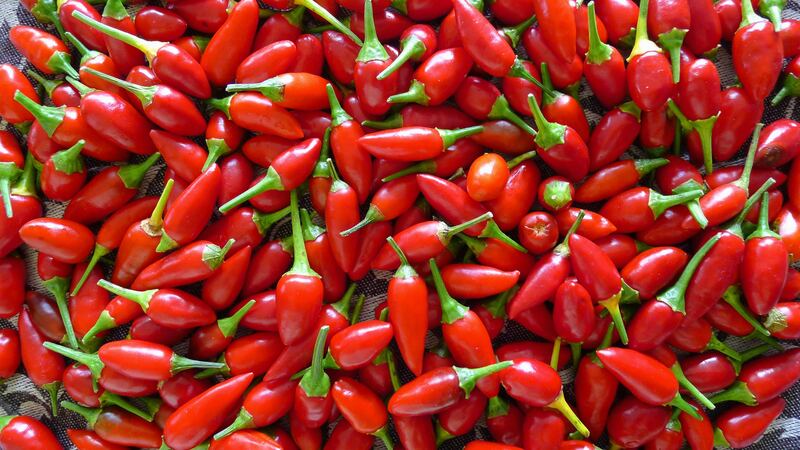 and producing medium hot fruit, and a third, which produces small, red, hot, wedge-shaped chillies that are highly susceptible to blossom end rot disorder. This will be culled. ‘Piri Piri’ chillies register between 50 – 100,000 Scoville heat units, they’re very hot, and the jam they make can be used in small quantities to great effect. However, gardeners can influence the heat of their chillies through culture. Plants given less water tend to be hotter and conversely, chillies which are regularly watered tend to more accurately fit the Scoville Scale. You can also de-seed chillies, this eliminates most of their heat. I can’t see the point in doing this, because if you don’t like the heat in a chilli, why aren’t you growing capsicum? Right now it’s the ideal time of year to get a great crop of chilli (or capsicum) before winter. To prevent blossom end rot, rake in half a handful of dolomite per square metre a fortnight before sowing or planting. Bird’s Eye, Siam Gold, Banana, Cayenne, Piri Piri.